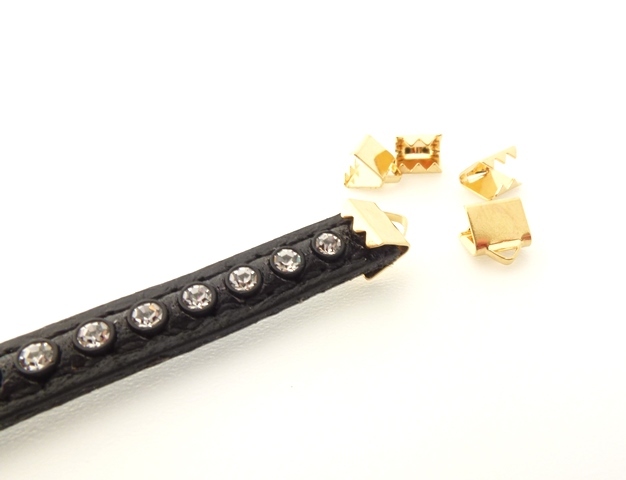 I've spotted some bracelets using magnetic clasps. While these make putting them on or off easier, they are not at all secure. All it takes is for the bracelet to catch on something, and it's gone! Similar problem with bar and toggle clasps if you're not careful. A pity if the bracelet were particularly valuable or sentimental. The solution is simple. 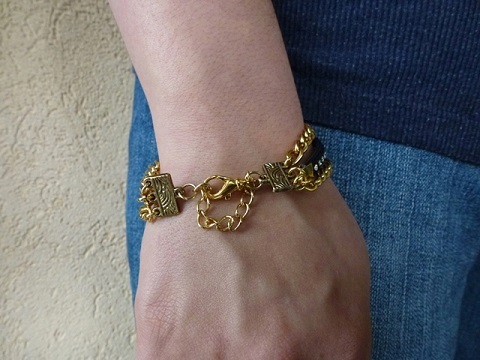 Add a simple chain connecting both ends of the bracelet. 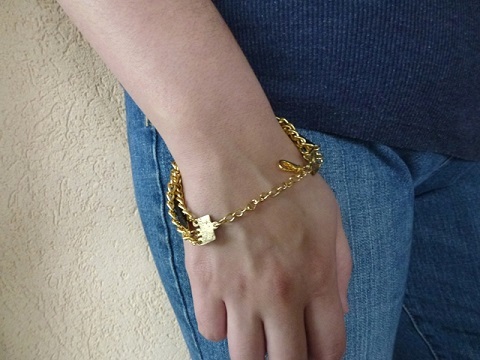 The safety chain idea will work for most bracelets. 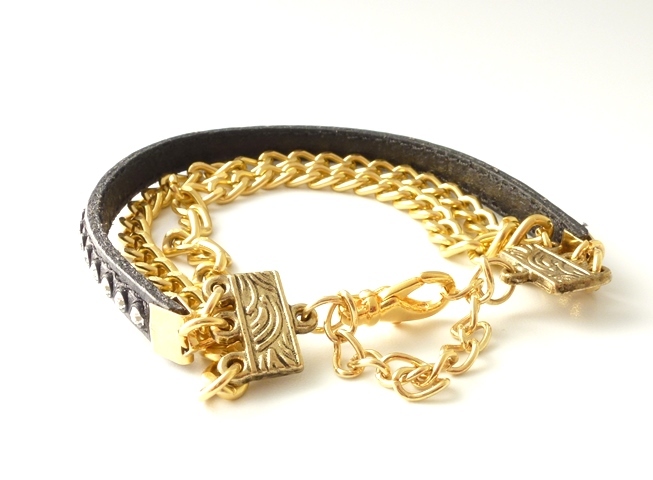 The multi-strand bracelet tutorial here features a strass leather length and chains. I received the strass leather cord from Endless Leather. There are other alternatives but I used ribbon crimps for the ends. Just slowly clamp down with flat nose pliers to ensure the "teeth" really bite into the leather. Assemble appropriate lengths of chain with a couple findings for multi-strand necklaces and attach using jump rings. Here are closeups of the connections. 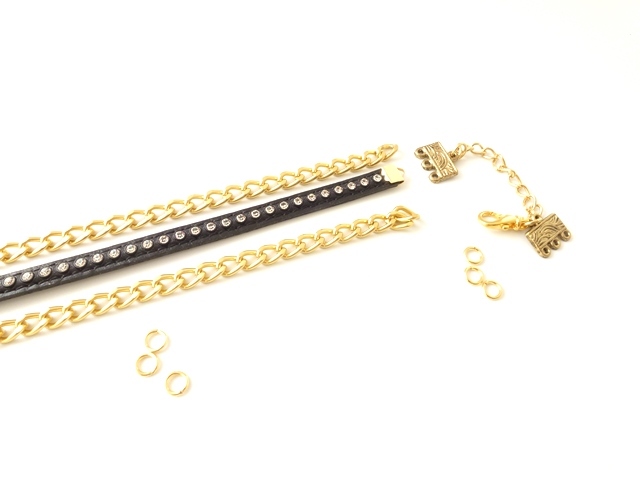 The safety chain also makes the bracelet an adjustable one. The bracelet will still remain on the wearer's hand should the catch fail! A Clever Idea - Wire a Button as a Clasp! Thank you for another great tip! I haven't made many bracelets but I've always been concerned about safety fastening. You're welcome! The worst fastening for bracelets are the magnetic ones because all it takes is for the bracelet to catch on something and it is apart! I agree about the standard magnetic clasps, especially on bracelets as they can snag on something and pull apart very easily. I put one on a Swarovski crystal bracelet that I made and the customer contacted me saying every time it caught on her purse, the clasp popped apart . I had to remake the whole bracelet in order to replace that clasp and now the only magnet clasps I use are those clever fold-over ones. There's no way for the magnet to pop apart on those. But I really should take your good advice and start adding a safety chain on my more expensive bracelets. Great tip Pearl! I have a bunch of the magnetic fasteners, but quickly stopped using them when I realized how unsecure they were. A safety chain would work quite well!